I met Jennifer from City Girl Prepper recently at a local preparedness expo. She is a busy mom of four who believes in being prepared. She introduced me to her bags and I thought they were a terrific idea. But it wasn’t until I showed my wife that I realized just how much so. She loved them so much that she became a City Girl Prepper Preparedness Coach and started selling them herself. Here is her review, Hey Ladies… Are you Prepared? The 30-liter backpack is a durable medium-duty pack that appears to be fairly well-made with double stitched and taped seams and what looks like black 400D canvas. While the zippers are not YKK, they do seem to be of a decent quality. The main pocket it 18″ tall, 12″ wide and 9″ deep. It takes up the entire back wall of the pack. Along the top of the pack, there is a quick-access electronics/sunglass pouch. It is about 5″ deep and runs along the entire width of the pack. Immediately below that pocket is the 11″ tall, 8″ wide and 1″ deep admin pocket with a bunch of smaller organizational pockets to help keep track of your pens, notebooks and such. On the outside of the admin pocket, there is a long thin pocket perfect for storing maps and important papers that you need to get to quickly. And on the outside of that pocket, there is another small easy-to-access mesh pocket. On each side of the pack, there is a mesh pocket large enough for a 32oz bottle with an adjustable slip-lock to hold everything in. The back of the pack is padded for comfort. The adjustable shoulder straps are also padded and are lined with a breathable mesh fabric for additional comfort. The last notable feature on the pack is the 1-3/8″ nylon webbed belt for better support on long trips. Out of the box, the 1 Person 3-Day Backpack weighs around 12-pounds all in. That’s a lot of gear for a starter pack. But what really caught my eye was many of the high-quality name-brand gear choices that were included, which I will detail in this review as best as I can. Please note that the products included may change over time… So I obviously can only comment on what I see included in the pack in front of me. Each pack is loaded up with twelve individual 4.225 oz foil pouches of Mainstay Emergency Drinking Water and one 3600-calorie Mainstay Emergency Ration brick which consists of 9 individual bars. Mainstay bars are rated for taste among the highest emergency rations. The pack also includes one resqme car escape tool, one Luci inflatable solar light, one Bazic 4′ x 6′ 5-mil tarp, one pair of medium True Grip gloves made for women and, one Tac-Force TF-810T partially serrated pocket tanto pocket knife and a Chlorine bleach conversion chart. The rest of the items are broken up into smaller individual kits that are packed in large zip-lock bags. But there is still plenty of room to enhance the kit to meet your own needs. One Ruggeed 6mm x 10-meter roll of multi-purpose utility rope. That’s right… It’s ruggeed… It says it right there on the label. One sewing kit that includes needles and safety pins, scissors, thread and a measuring tape. One black Sharpie, one blue ball-point pen, four 12″ cable ties and ten small rubber bands. Aside from getting some extra batteries for the kit, I would also highly recommend adding a Bic lighter, stainless water bottle and a lightweight personal water filter like the Survivor Filter or the MSR Trailshot Microfilter. Having a shemaugh in your kit is also important. Not only can you protect yourself from the sun, you can pre-filter water with it, use it as a sack, a light cover, and even use it as a sling. Light sources are also something that should definitely not be skimped on in my opinion. I would certainly consider adding a high-quality headlamp and/or flashlight like the Fenix HL10 Headlamp and the rechargeable Fenix UC35 Flashlight to your kit. This kit includes a deck of playing cards and a Word search book, some hard candy and a bar of dark chocolate. A good paperback book for passing time could also be a valuable addition to this kit. First aid kit includes: 30 band-aids in various sizes, 2-pair of non-latex gloves, gauze pads, alcohol prep pads, Butterfly wound band-aids, sting relief pads, an ice pack, self-adhesive sports tape, triple antibiotic ointment, surgical scissors, tongue depressors, anti-diarrheal medicine, allergy tablets, pain reliever/fever reducer and a Splinter-Out tool. This kit also includes one N95 Mask. However, I would consider adding at least one mask for each person who might be with you. Personally, I would also add at least one or two Israeli bandages, some QuikClot, and at least one R.A.T.S. tourniquet or CAT tourniquet for more serious trauma emergencies. This kit includes many of the items that you would expect from a hygiene kit like a disposable razor, a toothbrush and toothpaste, a pack of facial tissues, and some sunscreen. But it also includes a small pack of Purell hand and face wipes, a hairband and other feminine hygiene products (tampons, pads, mini-pads, feminine wipes). The sanitation kit includes one toilet waste bag and a Go Girl urination device, some toilet paper and two packages of antibacterial wipes. However, I strongly recommend adding a lot more toilet paper, Wet Ones antibacterial wipes and at least one bottle of Purell hand sanitizer to this kit. Even some paper towels and a small terry washcloth could really come in handy. No doubt about it… This kit includes a bunch of quality gear which makes it a great platform to build from. Plus there is plenty of room left to further enhance this kit for your own use. It is ideal for non-preppers and for individuals who are just getting started with prepping. But more specifically, for women which are undoubtedly unique in the current preparedness marketplace. So if you are looking for a good survival kit for your wife or your daughter, this pack is a great place to start. Well worth the price when you consider the piece of mind that you’ll have, knowing that they have this pack in their car just in case they break down somewhere or encounter some other emergency situation. They would also make a great bug-out bag if they had to leave the house in a hurry. 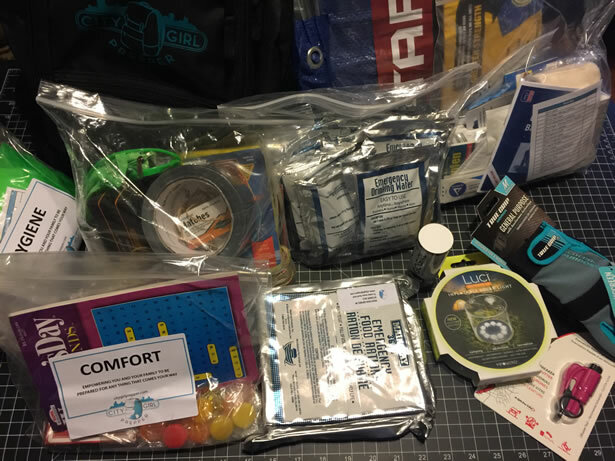 City Girl Preppers also offers many survival products including a 2 person 3-day backpack, a mini First Aid kit and several other kits designed especially for kids, students, dorm rooms and even pets. Shortly after taking a (CERT) Community Emergency Response Team course with her husband back in 2012, Jennifer Stewart-Tai, founder of City Girl Prepper went looking for a pair of women’s fit gloves and discovered that the marketplace was lacking women’s gear. 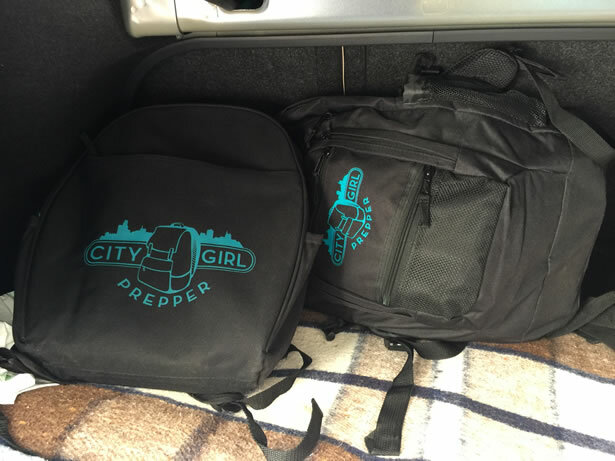 As a result, City Girl Prepper was created to help address some of the shortcomings in the women’s market.